Researchers at Imperial College London have developed a new approach that allows man-made materials to communicate with natural repair systems in the body to improve wound healing. They designed traction force-activated payloads (TrAPs) that could be incorporated into a range of medical biomaterials to enable selective activation of proteins by different types of cells during wound healing, such as collagen sponges that treat pressure sores and burns, and implants for bone repair. This new technique actively works with tissues to drive healing, significant as materials are usually passive bystanders during tissue repair, and wound healing is a highly dynamic, coordinated process involving many different cells over time. TrAPs could offer a way to design materials that communicate with these different cells in different ways and at different times, to constructively promote the process of tissue repair. When the body becomes injured, cells move through the collagen “scaffolds” in wounds, moving the scaffold, and activating healing proteins that start to repair the damaged tissue. As described in Advanced Materials [Stejskalová et al. Adv. Mater. (2019) DOI: 10.1002/adma.201806380], the team designed TrAPs to recreate this method of natural healing by folding DNA segments into 3D patterns called aptamers that hold on tightly to proteins. A customisable “handle” was then fastened so that cells could attach themselves at one end, before attaching the opposite end to a scaffold such as collagen. Tests showed that cells pulled on the TrAPs as they crawled through the collagen scaffolds, which made them unravel to reveal and activate the proteins that inform the healing cells to grow and multiply. By changing the “handle”, they could also alter which type of cell can grab hold and pull, allowing them to tailor the method to release particular therapeutic proteins. As it can be adapted to different cell types, it could be utilised for a range of injuries, including scar tissue after heart attacks, damaged nerves and fractured bones. This is the first example of an engineered, materials-based technology based on cells pulling on materials as a trigger to release and activate proteins. It is also the first demonstration that the activation and release of proteins can be made to be selective for different types of cells. As team leader Ben Almquist told Materials Today, “Combined, these features create the potential to design new biomaterials that function autonomously deep inside the body over time to encourage the healing of damaged tissues”. 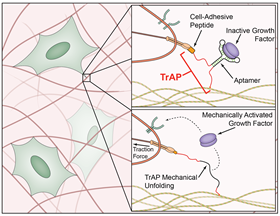 The researchers have began to test ways of optimally using TrAPs to promote the healing of damaged tissues in vivo, which could offer insight into translating the technology for clinical use, and are looking into traction forces as a trigger for controlled release, which could assist the development of dynamic biomaterials that interact constructively with cells and tissues.